Attention: This Bulletin is effective beginning February 4, 2013. This bulletin applies to theabove V6 and V8 gasoline engines ONLY. For Duramax™ diesel engines, refer to the latestversion of Corporate Bulletin Number 08-06-04-006. Always refer to the GM ServicePolicy and Procedures Manual — Article: 1.2.2.12 for the latest GM Policy and ProceduresInformation. This bulletin is being revised to add the 2014 model year, a Table of Contents, addNotice bullets to Section 1. for GM Requires and GM Recommends the CVN Procedure beingperformed, revise Sections 2. and 3. as Overview Information, add a Notice at theend of Section 4. and Section 6., revise Sections 8., 8.A., 8.B., 9., 10. and 11.and update the information including adding additional graphics. Please discard CorporateBulletin Number09-06-04-026F (Section 06 – Engine/Propulsion System). Be advised that GM REQUIRES retrieving the Calibration Information and performingthe Calibration Verification Procedure as outlined in this Bulletin, whenever diagnosticsdetermine a hard part failure may have occurred on internal engine parts and BEFOREdisassembly, repair or replacement of an engine assembly under warranty.Be advised that GM strongly RECOMMENDS retrieving the Calibration Information andperforming the Calibration Verification Procedure as outlined in this Bulletin, wheneverdiagnostics determine a hard part failure may have occurred on transmission, transfercase or rear axle components and BEFORE disassembly, repair or replacement of a transmission,transfer case or rear axle assembly under warranty.It is also RECOMMENDED that the engine control module Calibration Verification Procedurebe performed whenever diagnostics determine that catalytic converter replacement isnecessary.While it is not a REQUIREMENT to verify transmission control module calibrations ongasoline engine applications, like it is with engine control module calibrations,they can still be verified in the same manner if it is necessary for any reason. General Motors is identifying an increasing number of engine, transmission and catalyticconverter part failures that are the result of non-GM (aftermarket) engine and transmissioncontrol module calibrations being installed. When alteration to the GM-released engine or transmission control module calibrationsoccurs, it subjects powertrain and driveline components (engine, transmission, transfercase, driveshaft and rear axle) to stresses that were not tested by General Motors.It is because of these unknown stresses, and the potential to alter reliability, durabilityand emissions performance, that GM has adopted a policy that prevents any UNAUTHORIZED Service Agent warranty Transaction submissions to any remaining warranty coverage,to the powertrain and driveline components whenever the presence of a non-GM calibrationis confirmed – even if the non-GM control module calibration is subsequently removed. Warranty coverage is based on the equipment and calibrations that were released onthe vehicle at time of sale, or subsequently updated by GM. That’s because GM testingand validation matches the calibration to a host of criteria that is essential toassure reliability, durability and emissions performance over the life of the warrantycoverage and beyond. Stresses resulting from calibrations that are different fromthose tested and releasedby GM can damage and/or weaken components, leading to poor performance and/or shortenedlife. Additionally, non-GM issued engine control module modifications often do not meetthe same emissions performance standards as GM issued calibrations. Depending on statestatutes, individuals who install engine control module calibrations that put thevehicle outside the parameters of emissions certification standards may be subjectto fines and/or penalties. This bulletin outlines the Calibration Retrieval and Calibration Verification Procedures for ALL Service Agents including Service Agents NOT Required to Call PQC for Powertrain/Drivetrain Assembly Replacement Authorizationand Service Agents Required to Call PQC for Powertrain/Drivetrain Assembly ReplacementAuthorization, using the Tech 2® or GDS 2 to identifythe presence of non-GM control module calibrations. If a non-GM calibration is found and verification has taken place through GM, theremaining powertrain and driveline warranty may be blocked and notated in Global Warranty Management (GWM) and the dealership willbe notified. This block prevents any UNAUTHORIZED warranty claim submission. After retrieving the calibration information, Go to Step 2. After retrieving the Calibration Information and performing Section: 8. Calibration VerificationProcedure — For Service Agents NOT REQUIRED to Call PQC for Powertrain/DrivetrainAssembly Replacement Authorization — Using the Tech 2® or GDS 2 the Service Department personnel is required to retain all of the related documentation showing the procedures were completedin the ServiceAgent Vehicle History Service File.If the Calibration Verification Procedure determines that THERE ARE non-GM engine control module calibrations present, the Service Department PersonnelMUST follow the procedure as instructed in Section: 10. Procedure for All Service Agents for E-mailing .jpg or JPEG Files to the CalibrationGroup at — TACCVN@gmexpert.comWhen returning an engine assembly a printed copy of the Tech 2® Vehicle Information - Engine Calibration ID and Verification No. (Number/CVN)screen or the GDS 2 Calibration History (Events) screen shot must be attached to the documentation being returned with the unit. Section 6. 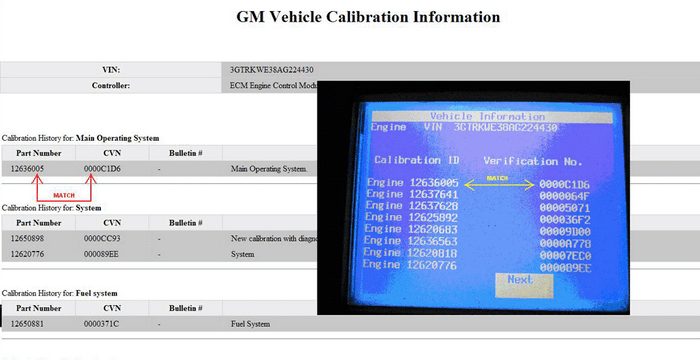 Retrieving Calibration Information From Global A Vehicles Using GDS 2After retrieving the Calibration Information and REFERRING to Section: 9. Calibration VerificationProcedure — For Service Agents Required to Call PQC for Powertrain/Drivetrain AssemblyReplacement Authorization — MUST be Performed by the Calibrations Group , follow the procedure in Section: 10. Procedure for All Service Agents for E-mailing .jpg or JPEG Files to the CalibrationGroupat — TACCVN@gmexpert.comThe Service Department Personnel is required to retain all of the related documentation showing the procedures were completedin the Service Agent Vehicle History Service File.When returning an engine assembly a printed copy of the Tech 2® Vehicle Information - Engine Calibration ID and Verification No. (Number/CVN)screen OR the GDS 2 Calibration History (Events) screen shot must be attached to the documentation being returned with the unit. Notice:This information applies to vehicles that are Tech 2® compatible and is typical ofthe procedure that will be used. Two examples of the Tech 2® Vehicle Information - (Engine) Calibration ID and VerificationNo. 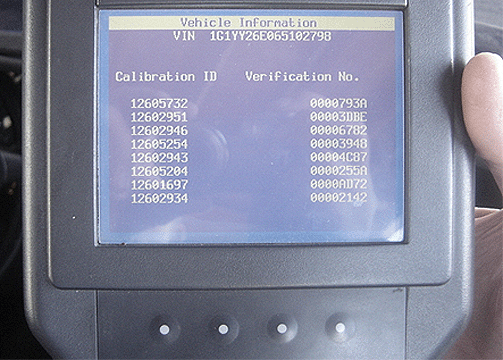 screens are shown.The Tech 2® Vehicle Information - Calibration ID and Verification No. 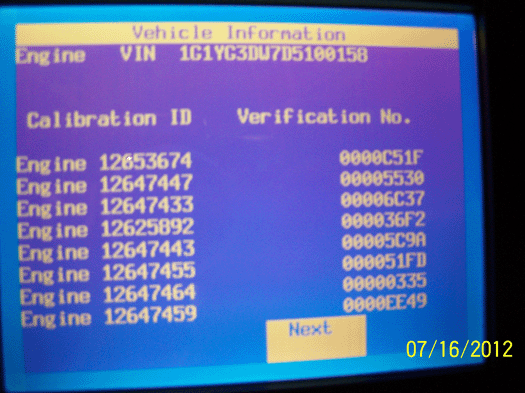 screen willdiffer slightly depending on vehicle and model year.Take a CLEAR digital picture(s) of the Tech 2® Vehicle Information screen showing the entire VIN, (Engine) Calibration ID and Verification No. (Number/CVN) and save itin .jpg format. Notice:It is recommended that an electronic copy of the Tech 2® screen photograph(s) alsobe saved. 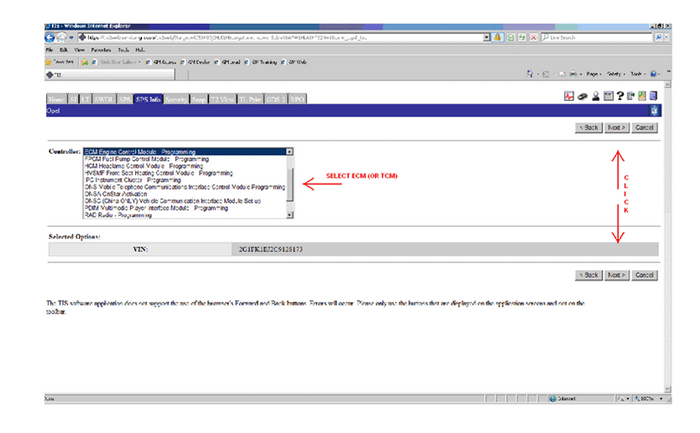 Notice:This information applies to Global A - GDS 2 compatible vehicles and is typical ofthe procedure that will be used. Turn OFF the ignition.Connect the MDI to the Data Link Connector (DLC) of the vehicle. Connect the MDI to a PC or laptop that has been downloaded with the GDS 2 applicationfrom TIS2WEB. Notice:At least one Diagnostic Package must be installed on the PC to perform diagnostics.If GDS 2 was just installed, select: Add New Diagnostic Package and then select a:Diagnostic Package to download. Select: GDS 2 icon on the PC.Select: Diagnostics icon.Select: serial number of the MDI being used.Select: Enter icon.Select: Module Diagnostics.Select: Engine Control Module. Notice:Due to the model selected, vehicle build, software and RPO variations, GDS 2 mayask for additional information in Step 10. 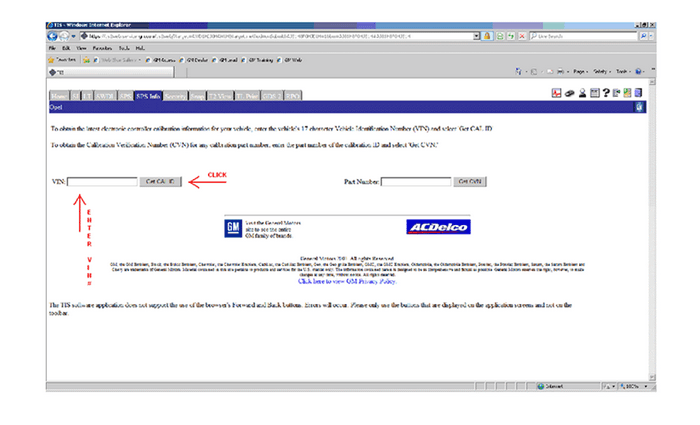 Select: Engine ID, if prompted.Select: ID Information.The Diagnostics page will appear. 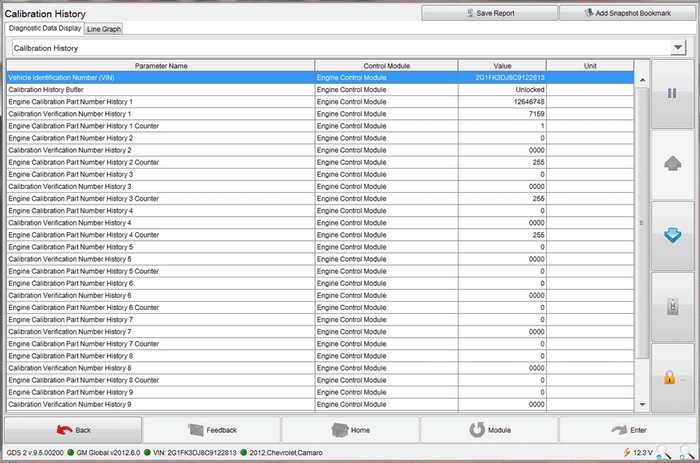 Notice:This is a typical view of a GDS 2 Calibration History Events Screen. GDS 2 is capableof displaying up to 10 Calibration History Events. Calibration History BufferNumber of Calibration History Events StoredCalibration Part Number HistoryCalibration Verification Number HistorySelect: Save Report.Select: Print. Retain a copy of the printed screen shot with the repair order.7. Creating a JPEG (.jpg) File From a GDS 2 Calibration History Screen Shot UsingMicrosoft PaintSelect: Start icon.Select: All Programs.Select: Accessories.Select: Paint.Navigate to: Calibration History .Press the: Print Scrn button.Open: Microsoft Paint.Select: Paste.Select: Save As.Select: Desktop.Select: File name. Name the file. As an example use the VIN.Select: Save as type, using the drop down menu.Select: JPEG8. 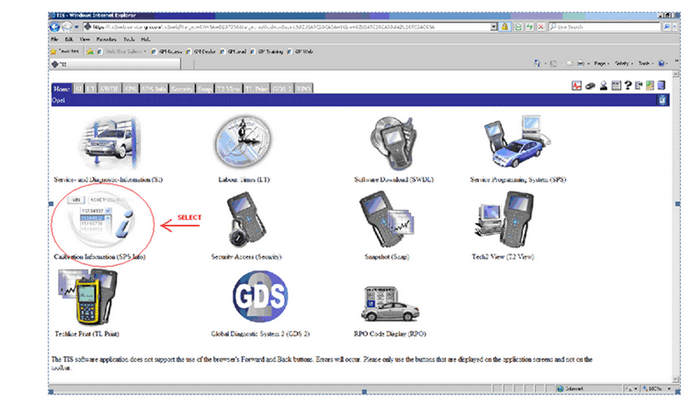 Calibration Verification Procedure — For Service Agents NOT REQUIRED to Call PQCfor Powertrain/Drivetrain Assembly Replacement Authorization — Using the Tech 2® orGDS 2Go to: TIS2WEB Home Page. Select: Calibration Information (SPS Info). Enter the: VIN.Select: Get Cal ID. 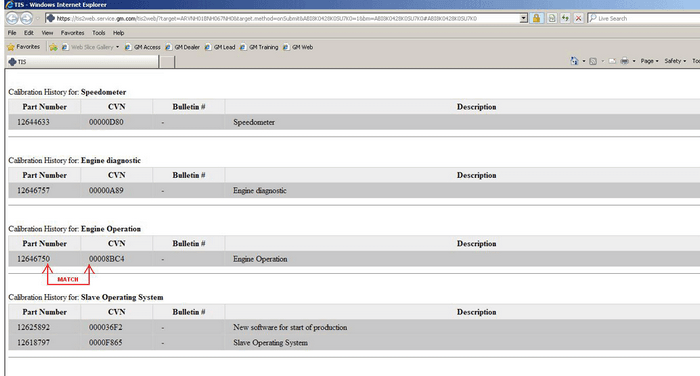 Select: ECM Engine Control Module — Programming from the Controller dropdown menu and select: Next. Compare each: Calibration ID Part Number and Verification No. (Number/CVN) from your Tech 2® photo to the corresponding Calibration ID Part Number and Verification No. (Number/CVN) listed in the TIS2WEBGM Vehicle Calibration Information screen of TIS2WEB to ensure that they are ALL an EXACT MATCH. If ANY of the Calibration ID Part Number and Verification No. 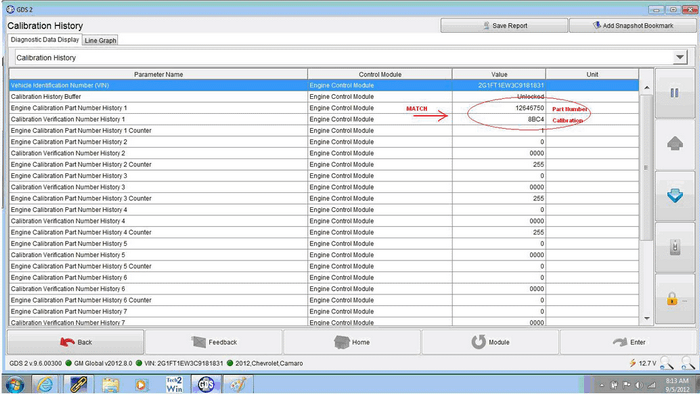 (Number/CVN) when COMPARED to the Calibration ID Part Number and Verification No. 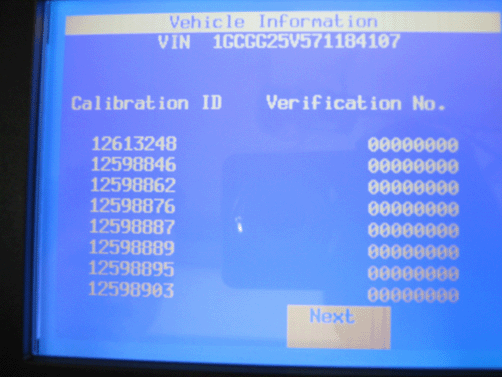 (Number/CVN) listed in theTIS2WEB GM Vehicle Calibration Information screen, DO NOT MATCH, then non-GM calibrations may be present and you should follow the procedure in Section:10. Procedurefor All Service Agents for E-mailing .jpg or JPEG Files to the Calibration Group at— TACCVN@gmexpert.com in order to e-mail your findings to the Calibration Group, who will then documentyour information with the appropriate Brand Quality Manager (BQM) in the Brand QualityTeam. 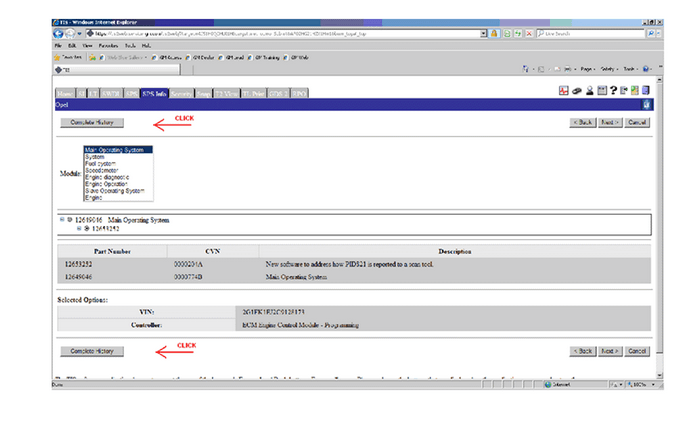 Compare each: Engine Calibration Part Number History parameter and Calibration Verification NumberHistory parameter from the GDS 2 Calibration History screen to the Calibration PartNumber and Calibration Verification Number (CVN) listed in the GM Vehicle CalibrationInformation screen of TIS2WEB to ensure that they are ALL an EXACT MATCH. ALL screen shots MUST be sent as a .jpg or JPEG file. Keep all photos in ONE e-mail.DO NOT e-mail photos from the GDS 2 in the automatic format of a .png file. Youre-mail will arrive at the Calibrations Group with the .png file(s) stripped by thesecurity firewall.Create an e-mail to be sent to: TACCVN@gmexpert.comAttach the Tech 2® digital .jpg photos or the GDS 2 .jpg or JPEG files to the e-mail.Keep ALL photos in one e-mail.In the Subject Line of the e-mail include the following:The phrase: “V6 Cal” or “V8 Cal”.The complete: VIN.The Service Agent BAC.In the Body of the e-mail include the following:The complete: VIN.The Mileage.The Service Agent BAC.The Repair Order (R.O.) or Job Card number.The Customer Complaint.The Cause of the Condition. Notice:Requests that are sent to the Calibrations Group are handled in the order in whichthey were received. The Service Agent will receive an e-mail reply after the calibrations have been validated.The e-mail reply will advise the Service Agent if the calibrations are OEM.If non-GM engine or transmission control module calibrations are determined to bepresent, the Calibrations Group will forward the case to the appropriate Brand QualityManager (BQM) for review. The BQM will then determine whether the warranty will beblocked and will respond to all parties concerned.You may call the PQC two hours after submitting the e-mail to the Calibrations Group(or after the results have been received by e-mail) for authorization to replace theassembly. This time allows the Calibrations Group to receive, review, verify the calibrationsand set up a case for the request. The Calibrations Group will also update the PQCor TAC case with the results of the Calibration Verification Request. Be prepared to provide all the usual documentation that is normally required whenrequesting an assembly authorization from the PQC. Notice:DO NOT contact GM Technical Assistance (TAC) to discuss warranty concerns on theaftermarket calibrations. ALL questions and concerns about warranty should be directedto the District Manager Aftersales (DMA), in Canada the DM-CCSP (District Manager-CustomerCare and Service Process). The Calibrations Group has a new e-mail address to be used when mailing the digital.jpg photographs of the Engine Calibration ID and Verification No. (Number) Informationtaken from the Tech 2® or JPEG photographs from the GDS 2 Calibration History screenshot. 12. Warranty InformationThe Dealership Service Management must be involved in any situation that would justifythe use of labor operation 0600014.Notify the District Manager Aftersales (DMA), in Canada the DM-CCSP (District Manager-CustomerCare and Service Process) of the situation.All claims will have to be routed to the Warranty Support Center (WSC) for approval.Please refer to Corporate Bulletin Number 09-00-89-016, Labor Operation 0600014 -Suspected Tampering or Vehicle Modifications for important information.